Some why questions may require a more complex approach, using a sequence of shots to explain a bit of backstory or perhaps a close-up on an object or detail that carries emotional significance in the context of the story. 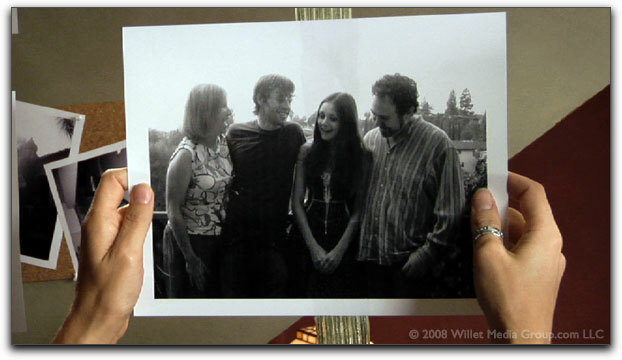 Memories Inspire: In this show, the young photographer reminisces about her once happy family. This serves as motivation for the action she takes in the following scene. This is also a case where the magic of juxtaposing two shots can suggest cause and effect. For example, if you constructed a sequence so that a shot of a woman slamming a door preceded a shot of a man signing divorce paperwork, it would imply that the wife’s exit prompted the husband to finally go through with the divorce. However, you could tell a very different story by simply rearranging the two shots so the paper is signed before the woman leaves; suggesting that the husband’s decision to sign provoked the wife to leave. As you increase your cinematic vocabulary, you learn to recognize how different shots answer different questions. And there are more than just those six basic questions but that’s where it all starts. You can also think about how certain shots can be used for different purposes. For example, certain shots can serve as Establishing shots, Reaction shots, Inserts, Cutaways, POVs, and so on. Establishing Shots are used to identify a location and have traditionally been used to introduce a scene. While most commonly they are Wide Shots or Long Shots, sometimes a small familiar detail can serve as an establishing shot. For example, if you cut to a new scene, and begin on a CU of a blinking “Code Blue” light, you quickly inform the audience that you’re in a hospital. 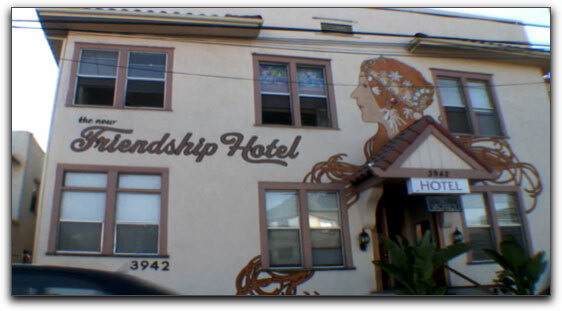 Feeling Friendly: The scene that follows this shot all takes place inside the hotel. We never need to see this outside shot again unless we return here later in the show. Reaction shots are usually just close-ups of a specific performance showing a subject’s reaction to a particular event. Often a reaction shot can be stolen from a different take, or even a different scene. There are many stories of an editor finding a few seconds of footage of an actor with his guard down after the director called cut, and using that clip as a reaction somewhere else in the scene. What’s fascinating about a reaction shot is that it only takes its meaning from the shot that precedes it. The same reaction shot can generate entirely different emotions in the audience depending on what it is that is being reacted to. Russian filmmaker Lev Kuleshov famously explored this concept in the early 20th century. Inserts and Cutaways, are invaluable to an editor trying to cut around problems in a scene, or trying to cut some time out of a sequence. Inserts are CUs of objects that have already been seen within a scene, such as a wine bottle or a gun. Cutaways are similar, but the subject of a cutaway is something that has not been seen in any of the other shots. For example, in a scene set in a park, you might cut away to a shot of dogs frolicking, even though we’ve never seen the dogs before. In another location a cutaway might be a clock on a wall, or other diners in a restaurant. geek this character is. The action of picking up the cupcake provides the perfect opportunity to cut to it. Note also, that the angle on the insert is the POV of the character. Inserts are usually pretty limited as to where you can use them: If the subject picks up the wine bottle in the wide shot, that’s the only time you can use the insert of the bottle being lifted in CU. On the other hand, cutaways can be used almost anywhere you need to escape from the main action. Of course, the more craftily and elegantly you work the cutaway into the scene, the smoother and less distracting it will be. So, for example, if there was a moment where an actor looked off screen, that might be a perfect time to cut to those frolicking dogs; thereby creating the impression that it was a point-of-view shot (POV). There are many other shot types and uses you will learn as you gain more experience. And just like learning any other language, the more expansive your vocabulary, the more precisely (and more eloquently) you will be able to communicate. Don’t forget also that shots are dynamic and change, a single shot can transform from one type to another through a camera move or through blocking. Who Are They? : A Close-up gives insight into who a character is. These shots leave little doubt that one is a no-nonsense sourpuss and the other is a idealistic dreamer. Close-ups can vary widely based on camera position, lens choice, and other production considerations, but ultimately you can count on such a shot to answer this fundamental question. If you were to go too long without providing close-ups your audience will lose track of whose story they’re following and they will very likely lose interest. This is especially common in complex action scenes where there is so much what and how to convey to move the story forward that it’s easy to forget to keep the who present in the viewer’s mind. But do so at your own peril. Even the most spectacular battle scene can fall flat if the audience loses track of who it is that’s engaged in the fight.